Yowza!media – Restaurant media consulting including social media, traditional media and overall marketing analysis. Chef Alex Tung is also available for culinary public speaking, cooking demonstrations and food focused team building events. Social media has proliferated through every segment of our lives and has changed the playing field forever. Companies are scrambling to catch up and will re-organize entire marketing departments based on the new paradigm of customer engagement. ; no where is this change more evident than in the restaurant industry. Social media marketing is the art of using social networks, online communities, blogs and other internet based media for marketing, sales, public relations and customer service. If social media marketing isn’t part of your restaurant’s current marketing plans, it should be. What are people saying about your restaurant online? That’s the big question every restaurant owner should be asking these days. Our goal is to help restaurateurs use social media marketing to attract, maintain and develop relationships with customers. Yowza!media has the answers and the implementation strategy that will take your restaurant to the next level. 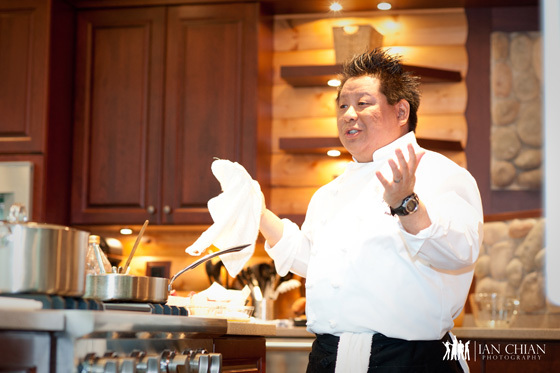 Chef Alex Tung has made many appearances teaching cooking classes, leading culinary demonstrations and public speaking on varied restaurant industry topics. Feel free to contact Chef Alex Tung if you are interested in having him make an appearance.